Hostelworld Country Winner for : 2010,2011,2012,2014 and 2015 ! Recommended by The Guardian and Lonely Planet. Free Netflix, Play Station 4 with FIFA 2019,Shisha... !!! Free Coffee,tea (all day long)!! 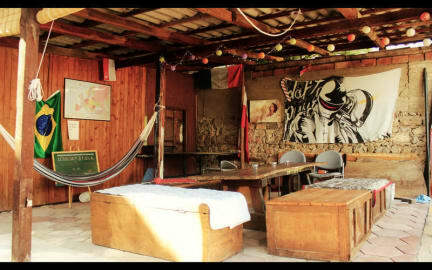 Sunny Lake Hostel is located in one of the oldest towns in the world, dating back to 4,000 B.C. With that being said, one can find plenty of adventures to delve into. The hostel is comfortably located in the old section of the town; it being a mere 2 minutes walk to a plethora of historical sites and just block from the main shopping strip. It's affordable, safe, and snuggly centered in a picturesque point of Ohrid, with an excellent view of the lake. Also : a washing machine and a dryer, a beer garden, an acoustic guitar, reading lights,floating beds,li-lo, frisbees, petanque, a football, hairdryer, badminton- All for free! Of course, one can just chill out on the hammocks an enjoy the stories and company of fellow travelers or enjoy time to themselves reading one of the many books we have on demand. Additionally we will rent bicycles for 3 euros a day. The staff at the hostel works on request. SunnyLake is the best hostel i have ever seen !! I highly recommend this hostel to travellers. You should join the boat trip that is arranged by hostel owner (Coko). It was really magnificent experience for me. By the way ----- Alex and Coko are the best !! !